Rob, Owner of Armonk Physical Therapy and Sports Training, is a licensed Physical Therapist, Board Certified Specialist in Orthopedic Physical Therapy, NASMI Certified in Sports Physical Therapy, NSCA Certified Strength and Conditioning Specialist, ACSM Certified Fitness Instructor and certified as an Advanced Hip Clinician with The Hospital for Special Surgery. Rob is also a Titleist Performance Certified Fitness Professional with his level 3 Medical certification. He is a graduate of Northeastern University’s Physical Therapy program with a Masters degree in Health Science from the University of St. Augustine for Health Sciences. Rob has over 20 years of clinical experience in orthopedics and sports medicine including working with college and professional athletes. He wrote an exercise column for a local magazine and has lectured at the high school level. Rob is also a former NCAA college football player with an avid interest in golf and skiing. John, Partner at Armonk Physical Therapy and Sports Training, is a licensed Physical Therapist with a Board Certification as an Orthopedic Specialist in Physical Therapy. His passion for Sports Medicine and exercise led him to pursue advanced certifications as a Certified Strength and Conditioning Specialist (NSCA) and a Level 1 Sports Performance Coach (USA Weightlifting). 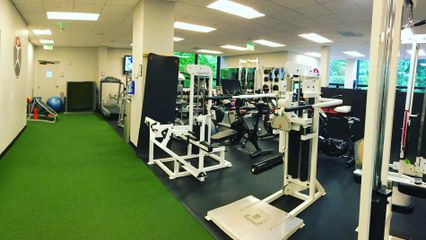 At Armonk Physical Therapy and Sports Training, he has dedicated work towards injury prevention, especially ACL injuries amongst young athletes. John is a graduate of the University of Connecticut with a Bachelors of Science degree in Allied Health and holds a Doctorate degree in Physical Therapy from New York Medical College. Throughout the Doctoral program at New York Medical College, John participated in various clinical experiences including an internship for the United States Navy in which he treated Marines and other Armed Forces members for Orthopedic/ Musculoskeletal conditions. John is an enthusiastic sports fan and has spent his whole life playing soccer and basketball including four years as a member of the UConn Men’s Club Soccer Team. Patrick Williams, is a New York state licensed physical therapist. His education includes a Doctorate in Physical Therapy from New York Medical College and a degree in kinesiology from UMass Amherst. Patrick is also a Certified Strength and Conditioning Specialist through the National Strength and Conditioning Association. Throughout his professional and clinical experience, Patrick has both worked with a wide range of individuals, ranging from pediatrics to division one athletes, weekend warriors to the geriatric population. Focusing on the individual person and their specific goals, Patrick not only helps to rehabilitate injury and ailments, but emphasizes optimizing human performance and maximal function, with a special interest in wellness and preventative care. Patrick recently developed a Fall Prevention and Balance Training Program. Stemming from his days as a high school wrestler, Patrick enjoys staying physically active and has competed both in powerlifting and various Tough Mudder events and road races. When not in the clinic or gym, Patrick enjoys playing chess, card games, and cooking, and avidly supporting all New England sports teams! Roxanne Perry is a licensed Occupational Therapist and certified Hand Therapist. She has over 20 years of clinical experience treating injuries of the upper extremity. Roxanne graduated from the University of Buffalo with a bachelors of science in Occupational Therapy and began working immediately in her specialty field of othopedics. Roxanne has spent a majority of her career working in Manhattan and is fortunate to have worked with many of the top leading hand surgeons. She continues to love what she does and is very happy to be bringing her experience to Armonk Physical Therapy. Jacki Bellissimo, received her BS in Physical Education from Manhattan College, where she served as a student athletic trainer and played Division 1 Softball. She earned her Masters of Science in Physical Therapy from Columbia University in 1988. After 17 years in a hospital-based setting; serving as Chief of Physical Therapy for 11 years, she now works part time in private practice with special interest in recovery from sports related injuries. Katalin Kapoor is a European trained, NYS licensed physical therapist with over 15 years of experience in outpatient orthopedics and sports rehabilitation. Katalin now specializes in treatment of spinal problems such as scoliosis, kyphosis and other postural dysfunctions. In 2005, Katalin pursued specialized training in scoliosis treatment in Hungary. She later became a BSPTS (Barcelona Scoliosis Physical Therapy School) certified Schroth therapist in the US. The Schroth method is a physical therapy technique for individuals with scoliosis and kyphosis. This method can be used to treat all ages with scoliosis and kyphosis and is a very individualized program determined by curve patterns, severity and patient’s age and level of function. Having been deeply involved in Europe where the method was invented - her passion is bringing this great method to the US where it is less known. In her free time, Katalin enjoys traveling, learning about other cultures and spending time with her family.